A panini grill is the perfect piece of kitchen equipment for preparing warm, hearty sandwiches that customers can order for a mid-afternoon lunch or a light takeaway lunch. If you’re offering a variety of sandwiches at your establishment, a panini grill can be a worthwhile investment that helps you cook several sandwiches with ease. When looking for a panini grill for your commercial kitchen, there are certain features you need to examine and some factors to consider before laying money down for a unit. Panini grill plates can be made from aluminum, cast-iron, or non-stick. Each of these has specific advantages and disadvantages. Aluminum is best for light to medium-duty use in small kitchen operations. Grills with aluminum plates are not as expensive so it may be worth looking into them if you have a strict budget to work with. Aluminum heats up very quickly and has rapid recovery times so you don’t have to wait a long time for the grill to get hot. However, aluminum also loses heat very quickly, which means you will still have to re-heat the grill in between uses. Food can also stick to aluminum plates, but you can use oil sprays to regularly season the grill and prevent food from adhering. Cast iron is well-known for its durability, which makes it perfect for heavy-duty use. Cast iron grills are heavier than aluminum, making them more difficult to move around. But this also means they are more resistant to scratching, chipping, denting, and regular wear and tear. Cast iron also provides consistent heat to help you produce evenly cooked sandwiches all the time. The downside to using a cast iron grill is that it requires a considerable amount of manual labor to clean. Cast iron is not corrosion-resistant and will need constant maintenance to prevent rusting. Food also sticks easily to cast iron if you don’t season the plates regularly. Panini grill plates with a non-stick coating are the easiest to clean among all plate materials. These are great if you want to reduce the use of oils in your cooking because you don’t need them to prevent food from getting stuck to the plates. Non-stick plates also heat up quickly and have rapid recovery times. However, they are not as heavy-duty as cast iron plates and are best for light to medium-duty use. Panini plates can either be smooth or grooved. Smooth plates allow for uniform cooking because both top and bottom plates are in full contact with the food. Grooved plates, on the other hand, give your sandwiches those tantalizing grill marks that help attract more customers to the sandwich table. Some grills have smooth tops and bottoms or grooved tops and bottoms, although some models come with a combination of configurations that allow you to use the grill for other functions. For example, panini grill with a grooved top and a smooth bottom can also serve as a griddle for cooking small pieces of meat. Other models have double grills, each with different configurations to provide the ultimate in cooking flexibility. 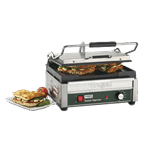 A panini grill with a floating hinge means you can adjust the top plate to accommodate the thickness of the food. This allows you to cook a variety of food items with different thicknesses. If your grill doesn’t have a floating hinge, you are limited to cooking standard-sized sandwiches, such as a ham and cheese sandwich, but have no room to make, say, a loaded Italian sub without smashing the sandwich. A floating hinge gives you the flexibility to serve a variety of sandwiches. 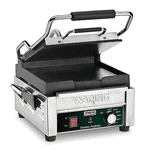 Some high-end panini grills have automatically balancing top plates that adjust to the thickness of the food. Most models use a torsion spring hinge, which lets you manually adjust the top plate so that it stays put where you place it. Other panini grills may also come with preset heights for specific sandwich types. An adjustable thermostat allows you to set the specific cooking temperature for your sandwiches. Standard grill temperatures can start at 120° F to 170° F and can go as high up as 500° F. The high temperatures are useful for seasoning cast-iron and aluminum grill plates and removing food that may have gotten stuck to the plates. Look for panini grills equipped with ergonomically designed, low-profile handles that make it easy for staff to reach for them. Panini grills with handles that are too high can pose a safety risk for your employees, especially for shorter people who may have to reach further for the handles. Also, it is worth investing in insulated handles that allow you to comfortably hold them without using mitts. Panini grills can get very hot and can affect the handles if they are not covered in high-quality insulation material. A built-in timer allows you to set the cooking duration for your food items. It is useful in busy kitchens where you need to work on other tasks while the sandwich is cooking in the grill. Panini grills are quite versatile and can handle a small variety of cooking functions aside from making sandwiches, such as melting cheeses and grilling small amounts of meat. The type of grill you need to buy will depend upon how you plan to use the unit. Commercial kitchens may choose from medium-duty grills that are designed for low-volume operations to heavy-duty models that are suitable if you’ll be making sandwiches most of the day. Heavy-duty grills are also better suited at handling a bigger variety of jobs, such as searing meats to be used as filling for your sandwiches. 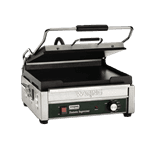 Single panini grills only have one bottom plate and one top plate. These are compact space-savers that can easily fit in a small commercial kitchen. Because of their size, single panini grills have a limited capacity and only one type of plate configuration that can cook only a single kind of food at a time. For higher-volume establishments, dual panini grills have two bottoms and two tops that often come with different configurations. These allow you to cook different types of food at the same time, such as a grilled cheese sandwich with perfect grill marks on one side and a chicken lettuce wrap on another. Of course, dual grills require a lot more counter space and use up more energy than single grills. 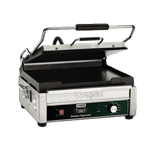 While commercial panini grills have adjustable thermostats, some may come with cooking presets for cooking specific types of sandwiches. This is especially useful if you have little time to train your staff to prepare sandwiches and manually adjust temperatures. However, preset heat settings don’t offer a lot of room for precision cooking. Cleaning the panini grill is crucial if you want your sandwiches to retain their flavor and quality. Aluminum and cast iron grills require more cleaning than non-stick grills, which need to be seasoned regularly to keep food from sticking. Non-stick plates, on the other hand, usually only need to be washed and rinsed in warm soapy water to clean them. Look for panini grills with removable plates because these are easier to clean. Another feature that you may want to look for is a drip tray. A drip tray collects grease, oil, and other liquids that may have run off from your sandwich while cooking. Some models even have angled trays to encourage quick drainage.